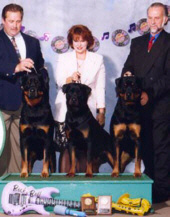 Von Baker Rottweilers located in Allendale, Michigan, U.S.A.
Extras: We'd like to thank all of the other people who we failed to mention in our credits. Especially the owners who've cared for, loved and entertained their Von Baker puppies. You know who you are!